The new Afghanistan war documentary Combat Obscura doesn’t introduce itself, explain itself, or end in a satisfying way. It’s weird, funny, disturbing, brutal, and heartbreaking—and one of the best documentaries in years. Combat Obscura is directed by Miles Lagoze, a former U.S. Marine Corps cameraman who spent much of 2011 in Helmand province in southern Afghanistan with a battalion of the 6th Marine Regiment based in North Carolina. After getting out of the Marine Corps and spending a little time processing his experiences, Lagoze, now 29, enrolled in film school at Columbia University. He just graduated. Combat Obscura is his first movie. Lagoze came home from Afghanistan with all the footage the Marine Corps doesn’t want the public to see. 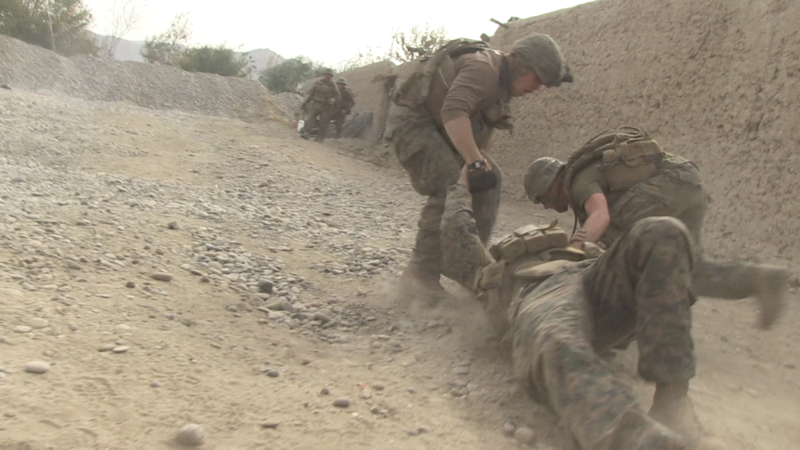 As a United States Marine in Afghanistan, Miles Lagoze, the director, worked as a videographer, documenting scenes of war for official release. (We see a clip of such material on CNN midway through the film.) Somehow, Lagoze kept his hands on unreleased footage he and others shot in Afghanistan in 2011 and 2012, and made it the basis for this film. The film’s true brilliance lies in its situational hysteria, a scene-by-scene unpredictability that serves as a microcosm of a war with no end — and no definitive outcome — in sight. Like the forever war, a lack of closure looms ominously over the film, a sentiment echoed by many of the war’s actors. Lagoze is no different. This entry was posted in Afghanistan, counterinsurgency, film and tagged Afghanistan, Eric Schuman, Miles Lagoze, US Marine Corps, war by Derek Gregory. Bookmark the permalink.